A return of Summerworks 2018's sold-out run! Tonight, and later, and earlier, three sisters (no, not those ones) are stricken with a series of strange plagues. Let’s talk about family nightmares. I mean, uh, memories. Please note: There is no telephone box office service for Plano. Tickets are available online or in person at the theater about an hour before showtime. 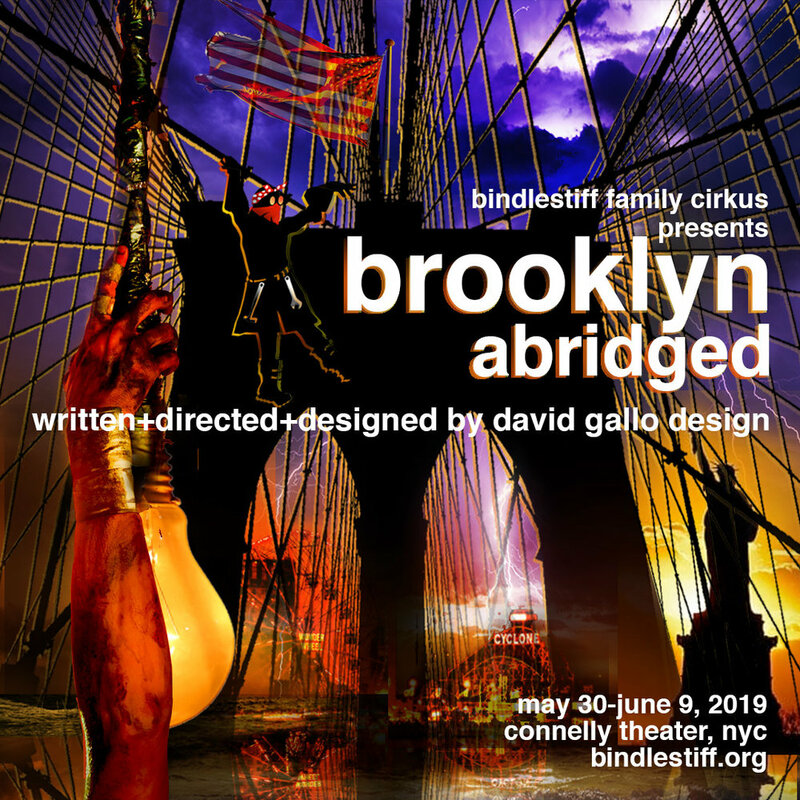 Bindlestiff Family Cirkus presents Brooklyn Abridged, a highly sylized visual and aural journey through the beautiful borough of Brooklyn, where citizens, civil servants, and visitors showcase individual artistry set against iconic landmarks. Combining history, humor, and heart, this unusual ensemble fuses circus arts, original live music, industrial lighting, and live analog projections into intertwined vignettes. Each act takes us on a personal adventure with a unique visual approach, as individual residents of the borough magically seize opportunities to portray their personal stories. Together they fuel the furnace and stir the cauldron that is the energy, diversity, and beauty of Brooklyn. 2 weeks. 8 new full-length shows by women writers & composers. Now in its fourth year, the 2019 She NYC Arts Summer Theater Festival is the city's premiere spot for presenting the best work by up-and-coming women writers and composers. The 2019 Festival will showcase 8 new full-length plays and musicals, including a New Play Residency in which a returning writer will build an entirely new piece from scratch. In addition, She NYC's new educational program, CreateHer, will present staged readings of 5 new short plays written and produced by high school students on June 30th. At the beginning of the 20th century, German playwright Frank Wedekind imagined Lulu as an ambiguous and irresistible heroine who embodied the complexities of a changing social landscape with sexual identity and power at its center. At the end of the 20th century, having just co-founded WaxFactory, Ivan Talijancic and Erika Latta turned their attention to this elusive and puzzling figure. Their production, inspired by Wedekind’s 1895 drama—as well as G.W. Pabst’s 1929 film and Alban Berg’s 1935 opera—challenged the idolatry and misogyny of the male gaze in the artistic representation of women, exposing its conflicting tendencies. In WaxFactory’s performance, scene after scene, Lulu morphs her way through a multitude of age-old archetypes, methodically dismantling and exorcising them, one at a time. Their first formal collaboration, the work premiered and toured overseas, inaugurating their reputation as a company invested in interrogating the nature of gender, power, and performance. In 2019, WaxFactory will celebrate its 20th anniversary by returning to their original production with new eyes, reimagining it for the 21st century. Inspired by the momentum of feminist protest, Talijancic and Latta revisit their unapologetic and unrelenting heroine, asking new questions about agency, representation, and violence in the contemporary world. Founded in 1998, WaxFactory is an interdisciplinary group of creators dedicated to exploring a multiplicity of artistic visions, focusing on ensemble process, arts education and international exchange. Its founding members have developed a hybrid approach, investigating diverse narrative styles, visual/physical rigor, an integrated use of new media/technology, and site-specific work. WaxFactory grew out of a collaboration between founders Ivan Talijancic and Erika Latta (MFA graduates from Columbia University School of the Arts’ Theatre program) who advance the company’s mission through exchanges and co-productions across borders and disciplines to create innovative devised work. Their productions have been seen extensively in NYC (PS122, NY Theater Workshop, Lincoln Center, Dixon Place, HERE, Brooklyn Arts Exchange, The Invisible Dog, Japan Society, Abrons Art Center, Incubator Arts Project, 3LD, PRELUDE and COIL Festivals, etc.) and internationally at numerous venues and festivals in 20+ countries and 4 continents. Eve and Evan are twins roped into yet another desperately dull Halloween by their parents. Managing to break free, they maraud, pumpkin smash and toilet paper, inadvertently crossing the thin line between worlds on this night of all nights. Enter a house and a demoness who has been lying in wait for just such a pair. A harrowing cat and mouse game ensues with the stakes nothing less than their immortal souls. A tale wrapped up in horror, comedy and blood…and definitely not for young children. The Connelly Theater is unique in New York City: an intimate house with a classic proscenium arch and a raised stage. The Connelly is available for rental for theater productions, film and photo shoots, and events. Lighting and sound package included. Please note: We do not have a full-time box office on site. You can purchase tickets to all shows online 24 hours a day, up to two hours before a particular performance. In-person box office hours vary by show, but will usually begin 30 minutes prior to curtain.